Mitch Daniels, the former Bush budget director who is now Indiana’s governor, made the Republicans’ reply to President Obama’s State of the Union address. His performance was, well, boring. But he did say something thought-provoking — and I mean that in the worst way. For Mr. Daniels tried to wrap his party in the mantle of the late Steve Jobs, whom he portrayed as a great job creator — which is one thing that Jobs definitely wasn’t. And if we ask why Apple has created so few American jobs, we get an insight into what is wrong with the ideology dominating much of our politics. Clearly, Mr. Daniels doesn’t have much of a future in the humor business. But, more to the point, anyone who reads The New York Times knows that his assertion about job creation was completely false: Apple employs very few people in this country. Apple does, however, indirectly employ around 700,000 people in its various suppliers. Unfortunately, almost none of those people are in America. This is familiar territory to students of economic geography: the advantages of industrial clusters — in which producers, specialized suppliers, and workers huddle together to their mutual benefit — have been a running theme since the 19th century. And Chinese manufacturing isn’t the only conspicuous example of these advantages in the modern world. Germany remains a highly successful exporter even with workers who cost, on average, $44 an hour — much more than the average cost of American workers. And this success has a lot to do with the support its small and medium-sized companies — the famed Mittelstand — provide to each other via shared suppliers and the maintenance of a skilled work force. But the current Republican worldview has no room for such considerations. From the G.O.P.’s perspective, it’s all about the heroic entrepreneur, the John Galt, I mean Steve Jobs-type “job creator” who showers benefits on the rest of us and who must, of course, be rewarded with tax rates lower than those paid by many middle-class workers. And this vision helps explain why Republicans were so furiously opposed to the single most successful policy initiative of recent years: the auto industry bailout. So we should be grateful to Mr. Daniels for his remarks Tuesday. He got his facts wrong, but he did, unintentionally, manage to highlight an important philosophical difference between the parties. One side believes that economies succeed solely thanks to heroic entrepreneurs; the other has nothing against entrepreneurs, but believes that entrepreneurs need a supportive environment, and that sometimes government has to help create or sustain that supportive environment. And the view that it takes more than business heroes is the one that fits the facts. 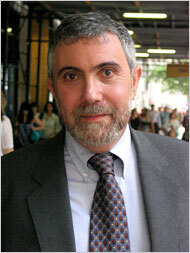 Το άρθρο του νομπελίστα οικονομολόγου Paul KRUGMAN δημοσιεύεται στην εφημερίδα «THE NEW YORKS TIMES».